African migration could boost growth and positively transform the structure of the continent’s economy, according to UNCTAD’s 2018 Economic Development in Africa Report released Friday, June 1. The report signed by Mukhisa Kituyi, the secretary-general of the United Nation Conference on Trade and Development, UNCTAD, reveals that no fewer than 17 million Africans left the continent in 2017 in search of greener pastures, while 19 million international migrants moved within Africa. Africa is a migration destination for 5.5 million people who came from outside the continent, the report says. The new report, subtitled “Migration for Structural Transformation”, does much to counter this narrative. Historically and in line with established trends, the report says that most African migrants move within the continent. The report follows the stories of Mamadou and Ramatoulaye from Senegal and Afwerki from Ethiopia. While they are fictional avatars for two different types of migrants – skilled and low-skilled – their stories illustrate the benefits and pitfalls that intra-Africa migration has for trade and development on the continent. In 2017, the top five intra-African migration destinations (receiving countries in descending order) were South Africa, Cote d’Ivoire, Uganda, Nigeria, and Ethiopia (all exceeding 1 million migrants), the report shows. 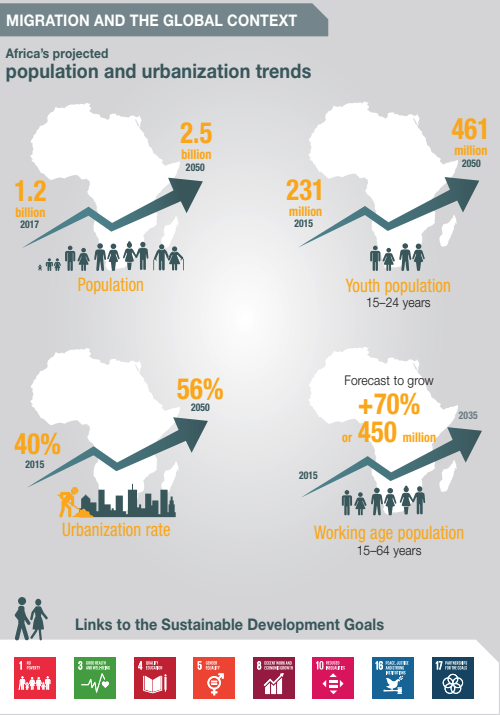 Behind the numbers lies economic analysis that shows the net benefit of migration in Africa. The contribution of migrants to GDP was measured at 19 percent in Côte d’Ivoire (2008), 13 percent in Rwanda (2012), 9 percent in South Africa (2011) and 1 percent in Ghana (2010). However, alongside the numbers of migrants moving and working within Africa, the continent also has some of the highest numbers of people forced from their homes due to conflict or natural disasters. Meanwhile, remittance inflows from outside and within Africa rose on average from $38.4 billion (2005–2007), to $64.9 billion (2014–2016). These accounted for 51 percent of private capital flows in Africa in 2016, up from 42 percent in 2010. This is why both intra and extra-continental migration are needed for supporting Africa’s structural transformation. The report, according to Junior Davis, the lead author, provided evidence of the “intimate correlation” between migration and trade – two sides of the same coin. “In this context, the report contributes to a better understanding of the implications of intra-African migration for the continent’s socio-economic transformation,” Davis added. The report’s analysis of the role of intra-continental migration in Africa’s development trajectory makes it a reference document that aims to assist in defining an African position in the Global Compact for Safe, Orderly and Regular Migration to be adopted in Marrakesh in December 2018.